North Korean leader Kim Jong Un said he is open to another summit with President Donald Trump — as long as the United States makes changes since the leaders’ last meeting. Telling North Korea’s Supreme People’s Assembly that U.S. diplomats came to the last meeting, which ended abruptly in late February with no agreement, without “a clear direction and methodology,” Kim had tough words for the Trump administration in his speech Friday. “If [the United States] keeps thinking that way, it will never be able to move the DPRK even a knuckle nor gain any interests no matter how many times it may sit for talks with the DPRK,” Kim said, according to a transcript published by the state-owned Korean Central News Agency. But Kim clarified that he thinks there is a path forward for an agreement between the two nations. “If the U.S. adopts a correct posture and comes forward for the third DPRK-U.S. summit with a certain methodology that can be shared with us, we can think of holding one more talks,” Kim said. 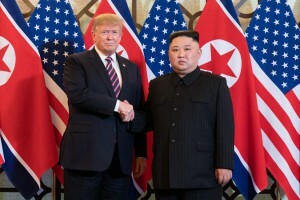 Despite the past two meetings he’s had with Trump, the first of which took place last June in Singapore, Kim said the United States remains hostile to North Korea. He said that hostility won’t bring about any agreement. Trump addressed North Korea in posts on Twitter on Saturday morning, saying he hopes for a third meeting with the country’s leader. “I look forward to the day, which could be soon, when Nuclear Weapons and Sanctions can be removed, and then watching North Korea become one of the most successful nations of the World,” Trump wrote. Kim called on both countries to set aside their respective unilateral demands to reach a compromise. Kim said North Korea has already done that by imposing a moratorium on nuclear testing. He announced last April that North Korea would suspend nuclear testing, although U.S. analysts said in November they believed a North Korean missile base remained active.